It’s time to make an educated guess! In this lesson, your students will practise using their background knowledge and evidence from the text to make inferences in nonfiction pieces about Martin Luther King, Jr., and Cesar Chavez. State your opinion but know your facts! Get your students jazzed about facts and opinions with this lesson that has them writing and sorting both types of statements. Are chickens cute? Do orcas eat seals? 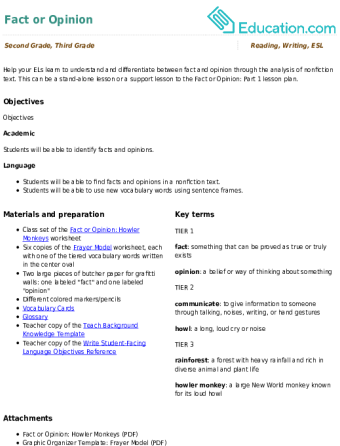 In this reading exercise, students will be challenged to differentiate between statements of fact and opinion. In this yummy exercise, students will differentiate between statements of fact and opinion as they read all about chocolate! 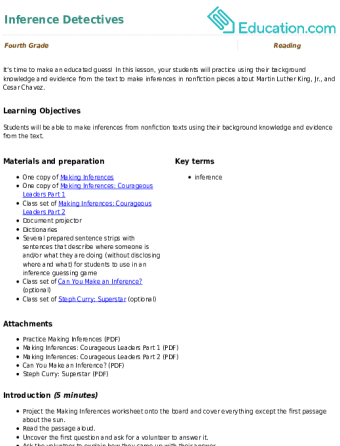 Help your ELs learn to understand and differentiate between fact and opinion through the analysis of nonfiction text. 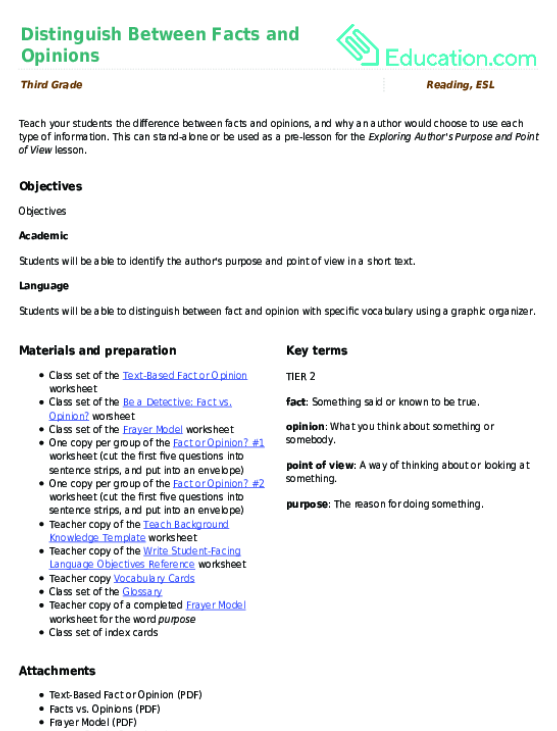 This can be a stand-alone lesson or a support lesson to the Fact or Opinion: Part 1 lesson plan. Students will use an adjective word bank to help them identify statements of fact and opinion. Fact or Opinion? You Decide! Help kids master fact and fiction with this comprehensive worksheet. Understanding the difference between fact and opinion is a critical skill. Your students will practise differentiating between facts and opinions in nonfiction texts and will apply the skills they learn to write their own statements. Teach your students the difference between facts and opinions, and why an author would choose to use each type of information. This can stand-alone or be used as a pre-lesson for the *Exploring Author's Purpose and Point of View* lesson. Do your students know the difference between a fact and an opinion? In this lesson, your class gets the practise they need to sort fact from opinion. Don't believe everything you read! Teach students to differentiate between statements of fact and opinion. This important skill will help students become critical and discerning readers. Read the Sign: Fact or Opinion? Is it a fact or an opinion? 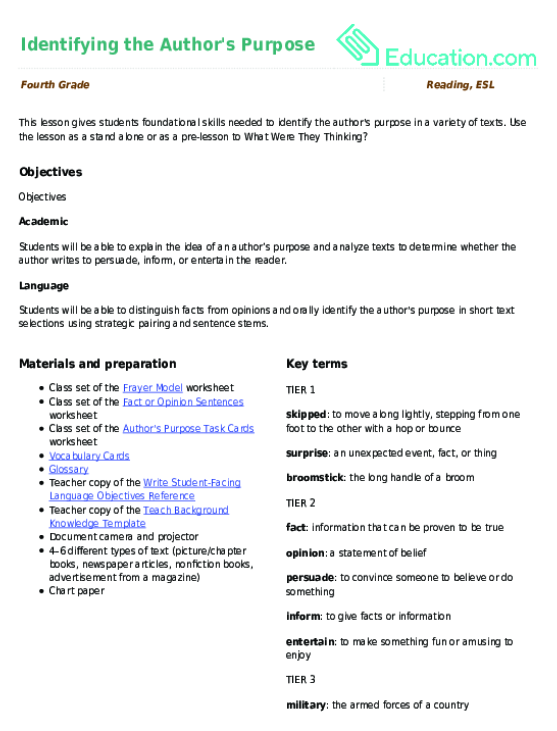 In this lesson, students practise identifying and writing different facts and opinions. Fact: This resource will give your students practise sorting out facts and opinions in their reading. 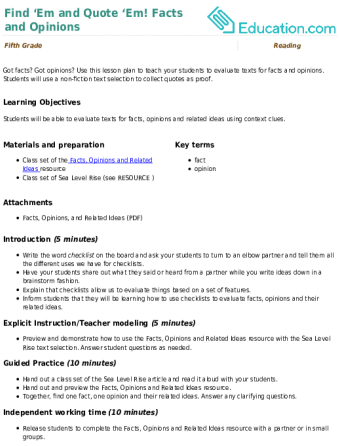 Students will use this graphic organizer to distinguish between facts and opinions they find in their text and explain their reasoning. In this lesson, your ELs will learn how to differentiate statements of fact and opinion in a nonfiction text using adjectives as a foundation for their understanding. This is a support lesson for Research: Where to Find the Answers. 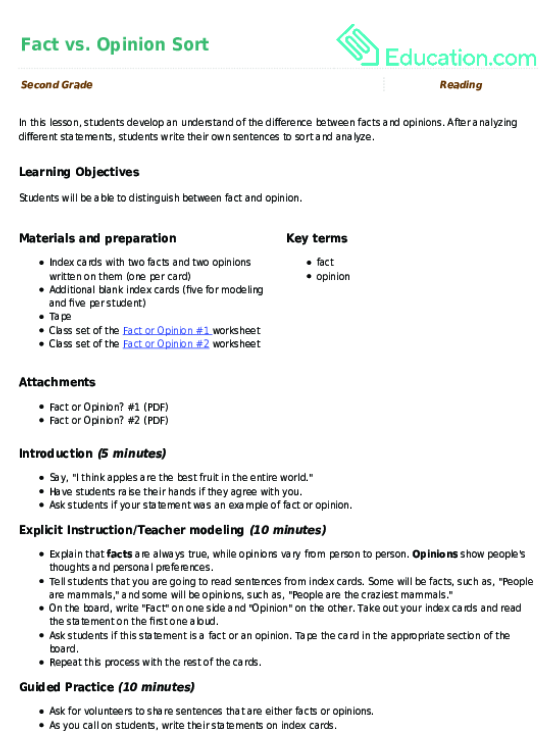 In this lesson, students develop an understand of the difference between facts and opinions. After analyzing different statements, students write their own sentences to sort and analyze. 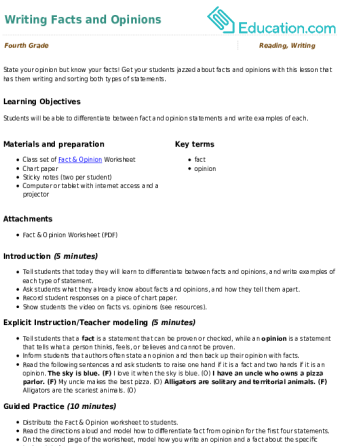 Sentence Sort: Fact or Opinion? Students will sort out sentences that reflect facts and opinions. The Sign Says: Fact or Opinion? Show kids how to sort fact from fiction with this worksheet. Got facts? Got opinions? Use this lesson plan to teach your students to evaluate texts for facts and opinions. Students will use a non-fiction text selection to collect quotes as proof. 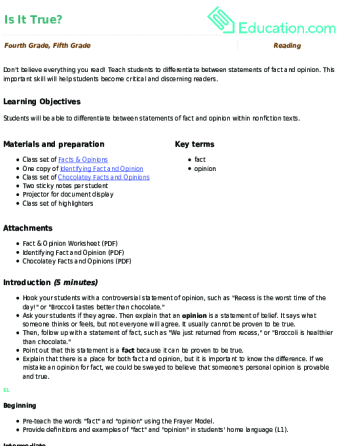 Use this glossary with the EL Support Lesson Plan: Distinguish Between Facts and Opinions. 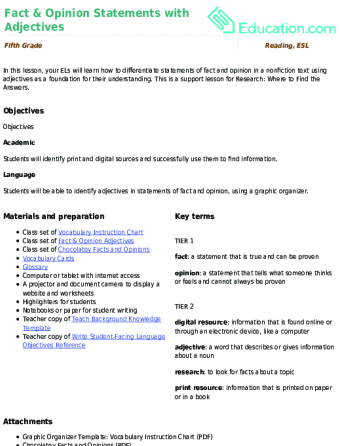 Your students will use this two-sided worksheet to practise distinguishing between facts and opinions. As they do, they’ll have fun learning about howler monkeys! Students will read a passage and search for signal words to identify facts and opinions.